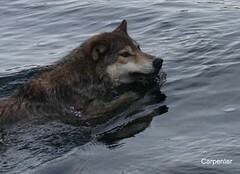 Where else on the planet do wolves take to the sea, swimming among forested islands to feed themselves? Where else can wolves make more than 75% of their living from marine resources like salmon, beached whales and seals? Where else can we learn how these magnificent animals used to live, before the planet suffered extensive loss of wild wolves in most other places? In the traditional territories of several First Nations – an area known globally as the Great Bear Rainforest – wolves live a unique and precious existence, and one we work hard to safeguard. Raincoast and its community partners continue to gain scientific understanding about wolves from the Great Bear Rainforest and across BC. Our vision is to ensure that wolves continue their wild ways amidst an uncertain future. They face challenges against which they have no evolved defences – human persecution, climate change, industrial forestry, trophy hunting, increasing marine traffic, exotic diseases. We must consider carefully what wolves require in the face of these threats. Where are the wolves in this vast archipelago landscape? How many of them move through these forests? What are the details of their evolutionary history? All of our conservation recommendations are grounded in rigorous, peer-reviewed research. Our partnerships with local communities, such as the Heiltsuk Nation of Bella Bella, have granted us unique insight into the lives of wolves. This partnership has the additional benefit of simultaneously fostering renewed cultural interest in wolves. And where we can, we go ‘straight to solution’ in applied conservation. In 2005 and again in 2011, in an unprecedented move, supporters helped us buy out – and extinguish – the commercial rights to trophy hunt wolves and other carnivores in a massive portion of this landscape. In BC and Alberta, wolf management is a pseudonym for aerial gunning, shooting, poising, strangling and suffocating wolves at the hands of provincial governments. These actions are premised on scapegoating wolves for the decline of caribou. In truth, caribou decline is the result of decades of habitat destruction by oil & gas, mining and logging industries, and an unwillingness to protect old forests from roads and motorized recreation. Learn why killing wolves will never stop or revere caribou recovery.